Nairobi is quite high up, at an elevation of 1661m, and it is just one degree south of the equator. It has a subtropical highland climate. Weather in Nairobi is generally sunny and warm in February, with average daily temperatures in February ranging from a maximum of 26 deg. C. to a minimum of 12 deg. C. Average precipitation is 57mm during the month. In the Great Rift Valley, the weather is similar but hotter, with February temperature ranges of 38 - 24 degrees, and precipitation of 47mm. On the coast around Mombasa, the February temperature ranges are 32-23 degrees and low precipitation of 15mm. Safety is our primary concern. We steer well clear of areas that are known for crime, and areas with dangerous animals. You have a training and information session on the first evening, which will give you more information which will include some basic safety tips, such as not to feed baboons, etc. Day 2	Day in Nairobi. Equipment check, warm up. Transfer to Nyeri. Day 3	85km	Cycle around Nyeri to Kiamutura. Return to Nyeri. Great views of Mt. 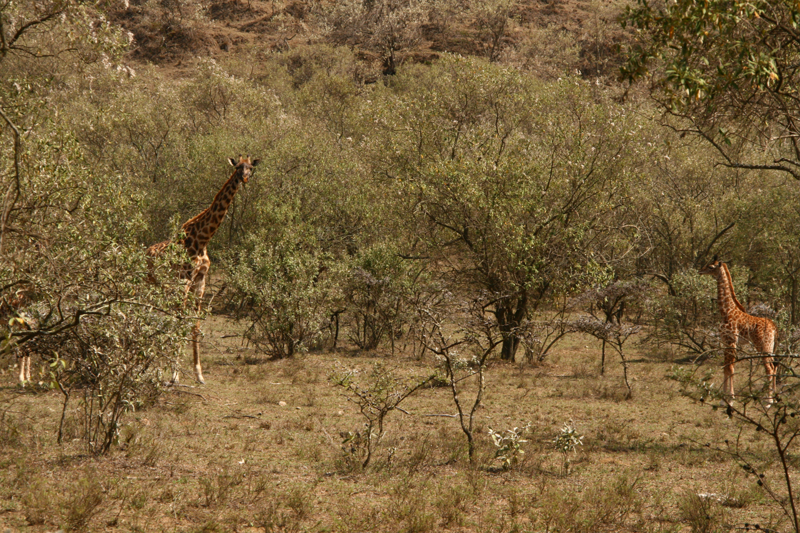 Kenya and Aberdare National Parks. and lush farmland, with a stunning backdrop of the Rift Valley. Day 5	99km	Cycle from Lake Naivasha to beautiful Lake Nakuru. Aberdare National Park is on your right as you go through fine farmlands of the Rift Valley. We stay in a hotel in Nakuru. Day 6	108km	Kabarnet to Eldoret. Hotel: Eldoret. We travel along good and quiet roads from Kabarnet to Eldoret. This part includes the toughest part of the challenge: a climb of the Elgeyo Escarpment. We go through various villages, including Ainamoj, and Kessup, and cross the Kerio Valley. Day 7	65km	Kapsabet to Kakamega. Morning transfer from Eldoret to Kapsabet. 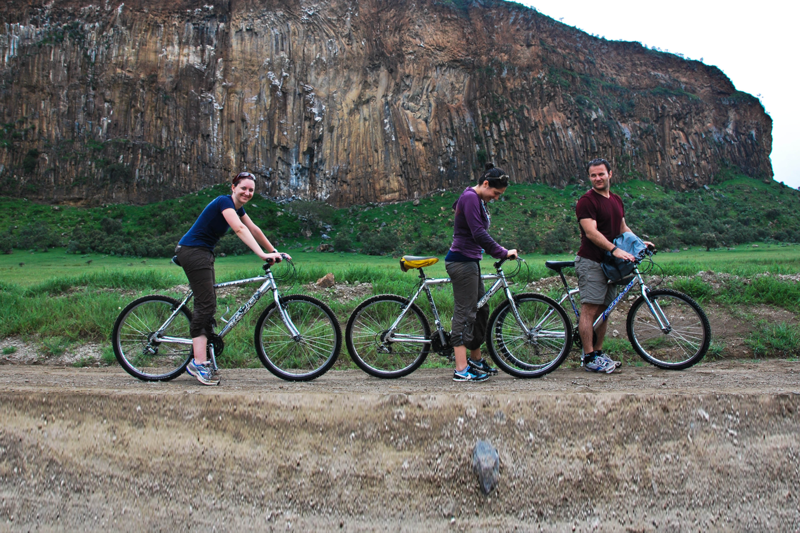 We cycle through the Rift Valley from Kapsabet. This route takes us through the Kakamega Forest reserve, which is great for both scenery and wildlife. Day 8	55km	Kakamega to Kismu. This route takes us from Kakamega to the shores of Lake Victoria, the largest lake in Africa. Note: this itinerary serves as a guide only. They should not be used as a guide book and are applicable only in conjunction with a Maximum Adventure trip / approved Leader. This trip has the potential for harsh weather conditions and visits areas where a short notice change of itinerary may be necessary. Details may be altered to suit the needs of participants, inclement weather, or any reason the guide deems necessary.